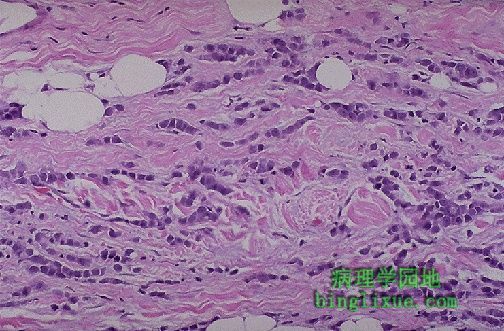 图示浸润性小叶癌。肿瘤见于乳腺末端小管。大约5%到10%的乳腺癌是这种类型。对侧乳腺有20%的患癌风险，且其大多数在同一乳腺呈多中心发生。图中可见肿瘤细胞的列兵样排列。 Invasive lobular carcinoma of the breast is shown here. 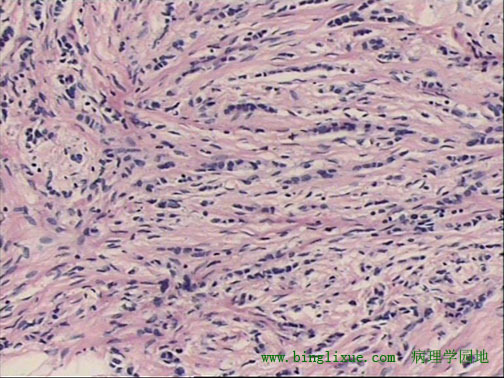 This neoplasm arises in the terminal ductules of the breast. About 5 to 10% of breast cancers are of this type. There is about a 20% chance that the opposite breast will also be involved, and many of them arise multicentrically in the same breast.